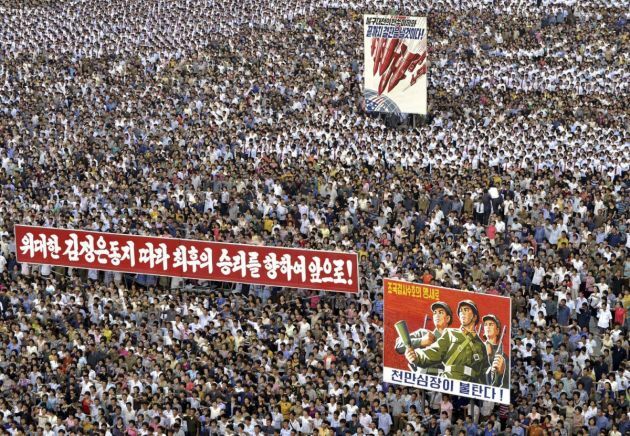 (Photo: REUTERS / KCNA)People attend a mass rally against "U.S. Imperialists" at Kim Il Sung Square in Pyongyang in this undated photo released by North Korea's Korean Central News Agency (KCNA) in Pyongyang June 25, 2014. The planned June 12 summit between U.S. President Donald Trump and North Korean leader Kim Jong-un is facing uncertainty after statements from Pyongyang and Washington. But the National Council of Churches in Korea (NCCK), representing South Korean churches is planning prayer vigils to express hope for lasting peace on the Korean Peninsula. Trump said on May 22 there was a "substantial chance" his summit with Kim Jong-un would not take place as planned on June 12 due to concerns that Kim was not committed to denuclearization, Reuters news agency reported. Trump raised his doubts about the Singapore summit in talks with South Korean President Moon Jae-in, who came to Washington to urge Trump not to let a rare opportunity with reclusive North Korea get away. If the summit is called off or flops, it could be a major blow to what Trump supporters hope will be the biggest diplomatic achievement of his presidency, and a huge disappointment for Trump. The NCCK is going ahead with its candlelight prayer meeting on June 7 at Gwanghwamun Square in Seoul, in front of the U.S. embassy, and is expecting hundreds of people to join. The square is also the same location as the Candlelight Revolution in which more than 17 million people gathered to demand the resignation of President Park Geun-hye and full democracy in 2016-17 and many other demonstrations in the history of the country. The NCCK is also calling upon its member churches and partners to organize prayer gatherings on the same day, or sometime before the summit. The churches' council has suggested that Korean Christians offer a minute's prayer each day from June 6-12. Prayer cards will be distributed with a flag on the cover that symbolizes a unified Korea that was used in the Pyungchang Olympic games. People will pray for the end of the Korean war, the realization of a peace treaty, denuclearization on the Korean peninsula as well as in the world, and a lifting of the sanctions against North Korea, along with humanitarian cooperation to meet urgent needs. In support of the NCCK and lasting peace on the Korean Peninsula, the National Council of the Churches of Christ in the USA, as well as the World Council of Churches has invited Christians and people of good will across the world to join in these prayers. The WCC will hold a candlelight prayer service at noon on June 7 at the Ecumenical Centre chapel in Geneva, Switzerland to express solidarity with its sisters and brothers in Korea.